Do you think you might be having a heart attack? In doubt? Don't delay! Call 9-1-1 fast. Time matters in your survival! Chest discomfort. 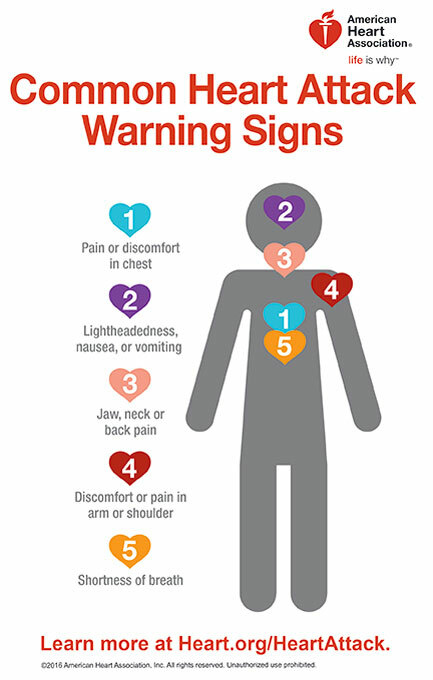 Most heart attacks involve discomfort in the center of the chest that lasts more than a few minutes, or that goes away and comes back. It can feel like uncomfortable pressure, squeezing, fullness or pain. Discomfort in other areas of the upper body. Symptoms can include pain or discomfort in one or both arms, the back, neck, jaw or stomach.